Dundee’s Waterfront is changing dramatically, yet its immediate surrounds are steeped in history. The seafront began as a concave sloping gravel beach. By the 15th century it was an open harbour, with two tidal basins. The large harbour sundial, erected in 1649 by the Guildry (still there in 1950s), monitored the loading of ships and a paved causeway, Lime Tree Walk, led to the market square. Here were the pack houses (cargo warehouses), forming the ‘exchange’, where merchants traded. The harbour was the reason for Dundee’s pre-industrial prosperity and significance as a great Baltic port. Merchant venturers traded internationally in a sophisticated range of goods. The early harbour lies under the lower street blocks between Union Street and Castle Street. Although improved in subsequent centuries, it was comprehensively redeveloped from 1815, with the outer sea wall extended out to its present location. Later developments extended this line eastwards, down-river. The railways built to east and west were also pushed out on embankments and the stagnant lagoons created alongside infilled. The enclosed docks were prone to silting and were replaced by wharves open to deeper channels out into the estuary, suited to larger ships. 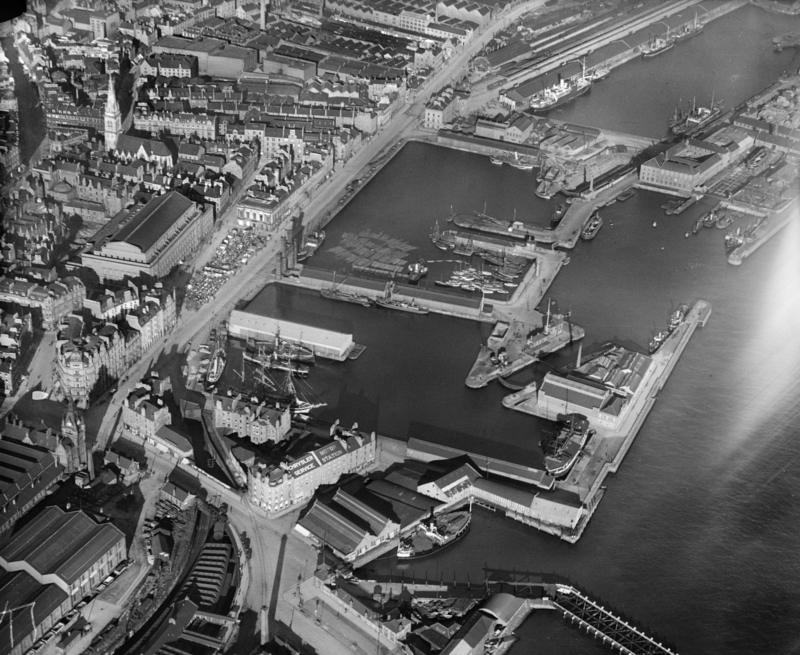 The docks closest to the centre were infilled in 1962-63 to create the landfall area for the Tay Road Bridge, leaving Victoria and Camperdown Docks in light use. Surrounding the docks were shipbuilding yards, leather tanneries, a cooperage, sawmills and timber yards, creosoting works, rivet works, copper works, ice factory, flour mills, oil works, gas works, cattle and fish depots, foundry and engine works. The whaling fleet was based here from the 1750s. Blubber was boiled in the Seagate yards to produce oil for lighting, jute processing, tanning and soap making – amongst other uses. The docksides were bustling with movement, noises and strong smells. The port activities merged with those of the city. The streets and lanes connected with the docks, and markets sprang up where streets were widened into small squares. Early transportation was by water and several ferry routes existed across the Tay. From 1848 a short-lived rail ferry also connected Tayport with Broughty Ferry. Then came the first Tay Bridge of 1878 and its replacement of 1887. The Tay Road Bridge, brought traffic straight into the city centre from 1966, and caused the new ring road system and demolitions and dock infillings. More recently Dundee took the radical decision to completely reshape this space, involving demolition of 20th century developments, building a much simpler road system, new street block development opportunities and exciting new public spaces. View over Craig Harbour, Earl Grey Dock (Frigate Unicorn against South wall) and King William IV Docl towards Victoria Dock, Dec 1927. SPW019939 © HES. Craig Harbour (c.1820) was built at the promontory of St Nicholas Craig, once an area of open ground with a chapel, west of the early harbour. It was one of several ancient crossing points on the river and was regularly improved. Three ferries, known as ‘Fifies’, were in service when the road bridge replaced them in 1966. The long pier was removed in the 1980s and the harbour was converted into a dry dock for Captain Scott’s RRS Discovery. The V&A museum is alongside. The Esplanade, from Craig Harbour west towards Magdalen Point, is a tree lined promenade created by land reclamation alongside the seawall for the Dundee and Perth Railway (opened 1847). It had its own Esplanade Station (until 1950), near the Tay Bridge. 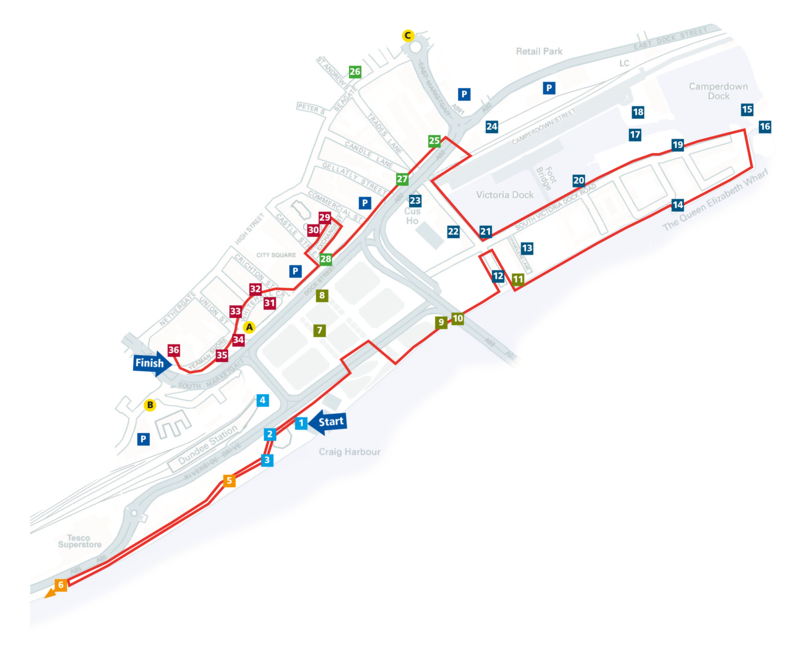 It is now an established walking and cycling route. Dundee is in the midst of a one billion pound redevelopment of the waterfront area with the V&A Museum of Design Dundee as its lynchpin. The central space, Slessor Gardens, is built over the infilled Victorian docks and the road bridge ramp is over the tidal harbour. Redevelopment sites have been created by the new grid of Waterfront streets. 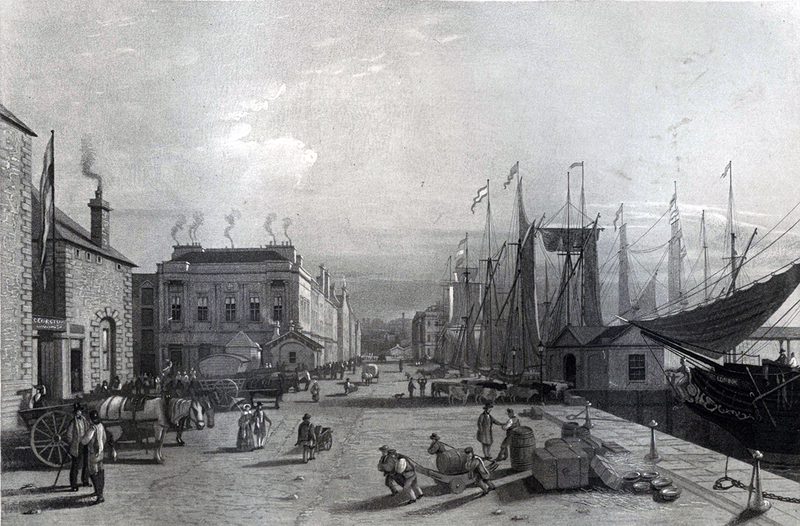 By 1815 modern docks were required to support the city’s industrialisation. Radical improvements to the existing harbour were completed from 1823 to Thomas Telford’s design: a new tidal, wet and graving dock complex (named for King William IV and Earl Grey) were pushed out. Telford’s later 1835 wet dock and associated tidal harbour scheme down-river was not completed until 1875. This is Victoria Dock. Camperdown Dock, further down, was completed in 1865. Victoria and Camperdown Docks and their surrounds provide an evocative setting for new office and housing developments, alongside conversions of the best surviving workshops and warehouses. This is all known as City Quay. Dundee is still an important port. The wharves further down-river superseded the harbours for larger vessels in the 20th century and are still functioning and not accessible to visitors. Across Dock Street the city activities merged into those of the port, with all kinds of associated industries, chandlers, storage facilities, and shipping offices within close reach of the docks and wharves. The Maritime Quarter stretched up to the Nethergate and along from Yeaman Shore to Seagate, interconnected by a warren of lanes, courtyards, wynds, closes and stairs, and inhabited by seafaring, shipping, crafts and trades people, and by most of Dundee’s inns and taverns. The shorefront houses were occupied by the leading men of the town – the merchant venturers and shipmasters. The streets were raised with the harbour and dock walls as Dundee reclaimed its shoreline. The once-fine houses were subdivided as the Quarter became more densely populated and commercialised; the wealthy merchants having long since moved to small estates on the periphery of the town. Much survived until the 1870s. The Alexander Wilson photographic and the Charles Lawson print collections in the Central Library (both digitised), together with the odd carved stone held in the city’s museums convey the quality of the lost 16/17th century houses, with their intricate carved stonework and interior panelling and look out towers. Some low level archaeology at Exchange Court and Blair’s Court. V&A Museum of Design Dundee, currently being built here, to be open in 2018. Competition winning design (2010) by Kengo Kuma & Associates. Discovery Point, visitor centre by Michael Laird Partnership (1992-93). Royal Research Ship Discovery (open to the public), launched Dundee 1901 by Dundee Shipbuilders Ltd, purpose built for Antarctic exploration. Café. Alexandra Fountain, c 1905. Drinking fountain, donated to the city, originally at the foot of South Union Street and relocated here in 1992. Dundee Station, built 1887-89 by the North British Railway Company as Tay Bridge Station on an island platform in a cutting. Uphill was their competitor, Caledonian Railway’s impressive West Station. The booking hall is being replaced by a new entrance and hotel development by Nicoll Russell Studios. The promenade is now known as Riverside Walkway. 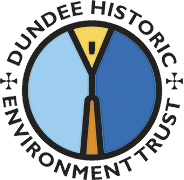 Several of Dundee’s acclaimed public art installations are here, plus information boards to enjoy and enlighten. Panel on pioneering seaplane flight, sculpture at Compass House, McGonagall Walk, memorials to Bridge Disaster. Tay Rail Bridge, 1881-87, by WH&C Barlow, to replace ill-fated Thomas Bouch bridge which collapsed 1879 (original piers visible at low tide alongside). Slessor Gardens opened in 2016. This space was once a complex of impressive docks for ocean going vessels. The earlier harbour was greatly improved (1815-25), designed by Thomas Telford to eventually include the Earl Grey Dock (1834) to the far west and the vast King William IV Dock (1825) with its outer tidal harbour, a careening beach and patent slip for grounding, repairing and launching ships (some of which survives) – and the west graving (or dry) dock. A Victorian public baths complex was located way out on the Earl Grey Dock’s outer protection wall – the dock’s outer wall survives and is currently being incorporated into the museum development. Red leafed trees opposite Caird Hall mark the location of the foundations of Dundee’s Royal Arch (JT Rochead, 1849), demolished in 1964. Telford Light, of c.1834 was a light tower (mini-lighthouse) providing a leading light on the wharf forming the outer wall of the King William IV Dock and the inner wall of tidal harbour. It was recently relocated seawards, to sit on the west pier of the tidal harbour entrance. It was part of a complex system of coloured lights designed to guide shipping into the docks and avoid dangerous rocks and sand banks and aligned with the town’s Old Steeple. The east pier sports a standing stone by Charles Henshaw commemorating the bridge construction project. The sea wall has been heightened to protect Dundee from flooding caused by rising sea levels. Tay Road Bridge, designed by William Fairhurst opened in 1966 as the longest bridge in Europe at 1.4 miles long. Lift or stairs to take you to the pedestrian path. Patent Slipway of 1837, this is the substantial eastern end of a slipway which raised and lowered large vessels in a cradle into the tidal harbour to the west of here. The building close to the head housed a stationary steam engine to power the cradle, removed 1960s. The Arctic Tannery which processed seal skins either side of the slip, partly survives. The housing on the west side of Chandler’s Lane is converted from the Harbour Workshops of 1837 and 1850; the arcades and chimney were a smiddy for testing and repairing iron chains. Opposite was the Panmure Shipyard, also converted to housing. RRS Discovery was built here and launched from the nearby slip. Crane Rails remain along Marine Parade from some of the travelling cranes used to move goods. Camperdown Dock is a large wet dock formed in 1857-65 from Telford’s 1833 tidal harbour. Gate to Camperdown Dock prevents tidal changes in the dock. Victoria Dock, begun 1833 to Thomas Telford’s design by the harbour engineer James Leslie and completed 1875, one of the largest and most important enclosed docks in Scotland. Across the dock are the Clock Tower Warehouse (1877) and Transit Sheds (from 1874). Originally continuous sliding doors fronted the dock; still separated by cast iron columns doubling as rainwater pipes and with the face of harbour engineer David Cunningham. Warehouse was a granary, then bond, now loft apartments. Ornate railings to both sides. Some sheds now in retail or office use; the new pontoon and access bridge are part of the development. Memorial (2009) south of warehouse to wartime submarine activity, base was HMS Ambrose. Pump House, (1875) and East Graving Dock (1869-75): huge 500ft long dry dock, originally operated by steam powered pumps. Frigate Unicorn (1824) Britain’s oldest warship still afloat, one of the world’s most important ships, survived due to being roofed rather than masted. In Dundee since 1873 as a drill ship and berthed in Earl Grey Dock until 1962. Open to the public. North Carr Light Ship, built by A & J Inglis, Glasgow, 1933, the last functioning lightship in Scotland when decommissioned in 1974. Intended to warn mariners of the dangers of rocks off Fife Ness. Berthed in Victoria Dock awaiting restoration as an exhibition space. Light Railway used for moving materials around the docks and to the stations for transport further afield. Apex Hotel by Ian Springford Architects 2001-03 (spa facilities built over part of the buried west graving dock – the first of Dundee’s Telford docks). The water tanks behind the hotel are modern urban drainage ponds, part of the flood defences. Customs House and Harbour Chambers, 1842. Two separate buildings within, one of the largest customs houses in Scotland. Dundee Harbour Trust was taken over by Forth Ports and the complex is awaiting a new use. Dundee and Arbroath railway of 1838 located its terminus here in 1854. Dundee East Station had a petal-like ornate iron gable; railways later joined by a tunnel. Site is now a car showroom. 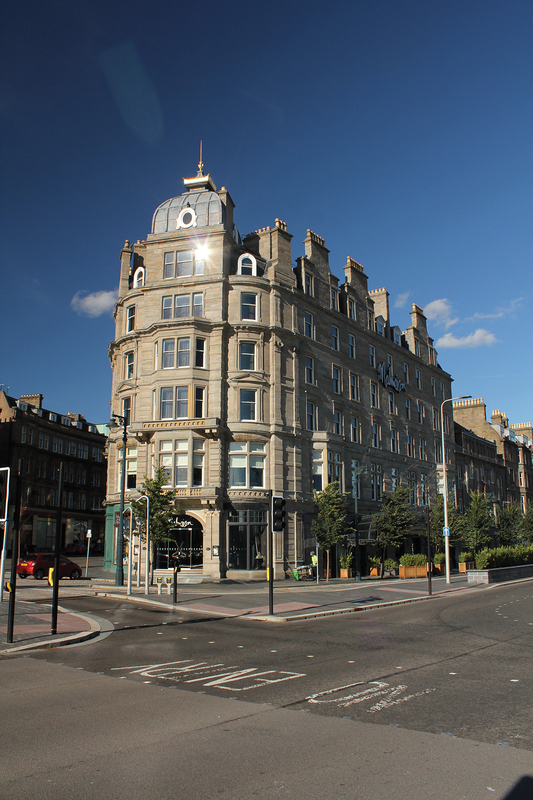 Maritime Buildings (James Maclaren & Sons, 1891), was built for Mudie shipowners and until recently, was the head offices of the Dundee Perth & London Shipping Company. DP&L founded 1798 for cargo and passenger transportation, is still trading from a different location. Their historic ship models are now secured for the city. Helm, training charity, occupies the Sea Captain’s House, 48 St Andrews Lane. Lone villa survives from early 19th century expansion of the town eastwards, originally with gardens to the shore. Overtaken by port related industry and land reclamations, the residents relocated to smog free mansions. Attached is Dundee’s first jute processing calender works of 1822; all saved and restored by Dundee (now Tayside) Building Preservation Trust in 1996. Former Dundee Sailors’ Home by Ireland and Maclaren, 1879-81, with rare but derelict Seamen’s Chapel to rear. Up to 80 visiting sailors used the hostel waiting for their next sail. Ornate turret and carved frieze and other decorations on a maritime theme. Lane names in the vicinity also reflect the maritime heritage. Exchange Coffee House designed by George Smith and built 1828-30 as meeting place, reading room, and library for Dundee’s mercantile elite, superseding the ‘exchange’ of Lime Tree Walk. Built over vaulted storage cellars which substantially predate it. The restaurant building at 26-28 Exchange Street was a ship’s biscuit factory and warehouse of 1868; hoist door in the gablet. Exchange Courtis over the 1644 Packhouse Square complex of vaulted cargo warehouses, sealed 14ft below the paving, reckoned to have been destroyed by a great wave in 1755. Ironically, from the 1600s a huge statue of Poseidon (Greek god of the sea, storms and earthquakes) was located behind on Castle Hill as a shipping landmark. Dundee’s trading partners have similar statues. Danzig (Gdansk) recently restored one dated 1549 and Gothenburg added one in 1923. The Old Flour Mill building dates from at least the early 19th century, but also has older foundations (the town’s grain mills were here in the 16th century). It was once 7 storeys tall and incorporates parallel arcades one being ‘inside-out’, from a demolished adjacent warehouse. Café upstairs. Whitehall Crescent and Dock Street are on the site of the city’s pack houses of 1756, later used as salt warehouses and weigh house, and replaced by the Gilfillan Memorial Church (1887). The Green Market occupied the lower part of Crichton Street, once the fish market and originally Lime Tree Walk. It was lost when the Caird Hall was built in 1914-22; the fruit and vegetable wholesalers relocated under the new church. Whitehall Crescent Dundee’s smartest 16th century lairds’ houses in Fish Street and Butcher’s Row when redeveloped in the 1880s. A major loss was the c.1560 pack house with arcaded ground floor and corner turrets. Coutties Wynd was the oldest and is now the last surviving street of the Maritime Quarter. Yeaman Shore originally intersected with it and Fish Street (now Whitehall Crescent) to form an open square. Here, west of the 1899 Malmaison Hotel was Trinity House or Sailors’ Hall (built 1790, demolished 1890), the home of the Dundee Fraternity of Masters and Seamen (active from 1556), providing hall, school, mariner’s church and accommodation. Their job until 1875 was the lighting and buoying of the Tay, to ensure safe passage, including lighthouses, beacons and providing the Tay lifeboat from 1830 (this transferred to Broughty Ferry in 1862). The Fraternity is one of the city’s oldest trade organisations, still active, nowadays focusing on charitable activities. Yeaman Shore continues west of the Union Street junction. Nearby stood an isolated windmill, marking the west end of New Shore, used for grinding malt, and later as a store for the town’s artillery and ammunition, later still part of the Cholera Hospital (isolating infected sailors). Behind was the massive town house and chapel of the Earl of Crawford, long gone. Hidden within the same street block and perhaps incorporating elements is Blair’s Court. Part can be seen from the street. A complex of courtyards and buildings of mixed antiquity, incorporating part of the last Dundee survivor of an entrance arcade (c.1600) – now at basement level, and a vaulted pack house.